Please refer to our stock # BPB200 when inquiring. 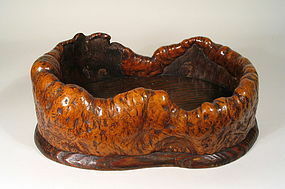 DESCRIPTION: This large, gorgeous Japanese tray is crafted from a beautifully undulating piece of burl with curled edges that turn and overlap into the interior. The wood is a rich brown and twists in the most sumptuous patterns; the base is made from one flat slab of Kiri (Paulownia) wood. Striking and unique from any angle, it is a testament to the eye of the craftsman who saw its beauty and fashioned it for use. Excellent condition and dating from the Meiji period (1868 – 1912). DIMENSIONS: 15 ¼” long (38.6 cm) x 12” wide (30.5 cm) x 5 ½” high (14 cm).